The summer of 1972 found me in San Luis Potosí Mexico, trying to learn enough Spanish to get my final college credits for graduation. I had not been a stellar foreign language student up to that point, so I was a bit “under the gun”. To get a better understanding of the culture, etc., blah-blah, we had a few travel days to see some sights. A couple of those days were spent in Mexico City. My mother had traveled extensively in Mexico, and she “collected” people wherever she went. She “arranged” for my then-girlfriend (now my wife of 45 years standing) and me to meet a young woman she knew. We rode the Metro to the end of the line, south of Mexico City, and “Blanca” picked us up and took us to her home in Coyoacán for dinner. My Spanish was still sketchy at that time, and I don’t remember many details, except the following little tale. We were visiting in the sala (the two young women were visiting–I was smiling, trying to look agreeable, and straining for a familiar word) when Blanca’s father came home from work. He entered through the back door that led into the kitchen. He was a stocky, mostly bald man of early middle-age with greying temples. He wore an oxford cloth blue shirt, open at the collar, and some nondescript pleated-front gray wool slacks. But he totally caught my attention when he pulled a 1911 from his waistband and deposited it in a drawer beside the back door! Now, I had been reading Jeff Cooper for a few years at that point, and he often mentioned “Mexican carry”. Cooper had a well earned reputation as a teacher, BUT–he was not good about repeating his definitions for late comers (which was ME). When Blanca’s father hauled that old 1911 out of his waistband where it had been nestled just behind his hipbone, I KNEW EXACTLY what Mexican carry meant! Ever slow on the uptake, I did not fully appreciate the significance of the father’s occupation until many years later, when I read Joaquin Jackson’s book, “One Ranger“, wherein he describes the singular power of being a Mexican general. Yep–that was Blanca’s father! A very short gun story. “I have a .45 caliber Colt 1911, with a seven round magazine, plus one in the chamber. “You Need More Ammo, Mrs. Clinton”. Paul Glasco explains that they have really piled on the paperwork and special requirements to get one of the 100,000 1911s being released by the Army to the Civilian Marksmanship Program. All this foofaraw will add to your costs and artificially inflate the price of these pistols. In my parents’ generations’ day, you could simply mail order surplus firearms from the CMP if you were an NRA member. My uncle had a stockpile of Springfield and 1917 Enfield actions he had purchased for peanuts stored in the floor joists of his basement ceiling to be made into sporters, one rifle at a time, by the gunsmith Al Compton of Ringtown when each of the boys in the family made it to hunting age. The .45 ACP M1911A1 pistol has served the U.S. armed forces for more than a century in every war zone and hotspot on the planet — and thanks to this year’s federal defense budget, it will serve civilians for the foreseeable future. The last transfer of 1911s to the CMP was in 2015, when President Barack Obama signed a defense bill that included a measure to transfer 10,000 pistols for sale to the program; lawmakers har stated that May that the DoD spends $2 a year to store each of its 100,000 surplus 1911s. With 10,000 already transferred and 8,300 additional pistols “sold or disposed of,” per Guns.com, that means there are at least 80,000 1911s ready and waiting for a nasty civilian to give them a good home. Just like Khyber Pass gunmakers. How are you going to stop them, Gun Controllers? Imagine what Americans with access to machine tools could produce in their garages. Phil Bourjaily, in Field & Stream 2011, remembered the best shot ever made with a Model 1911. 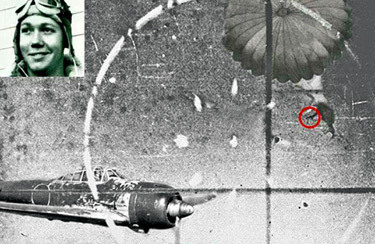 The Zero pilots circled back to strafe the parachuting crewmen, killing two and lightly wounding Baggett, who played dead in his harness, hoping the Japanese would leave him alone. Though playing dead, Baggett still drew his .45 and hid it alongside his leg…just in case. A Zero approached within a few feet of Baggett at near stall speeds. The pilot opened the canopy for a better look at his victim. After I received my [Marine Corps] commission as an officer, this gave me the right to carry a sidearm. An old Gunny told me: “Get one that rattles, it’ll never jam on ‘ya.” Well, the Gunny was right. I wasn’t a great pistol shot, but the old 1911A1 never missed a beat. In my two tours in exotic Southeast Asia (’68 and ’69) I used the pistol on a couple of occasions, and true to form, it never missed a beat. When I got back to the land of the Big PX I went out to the firing range and got the same results Roy did: 3-3 1/2″ at 25 yards. I still have that old warhorse, and from time to time I touch it off on my backyard range. The emotions keep flooding back overtime, then. What Will The CMP 1911s Sell For? I would expect CMP 1911 pistols to be about 30-50% less than the current market price. 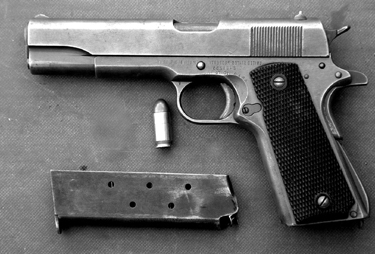 The market price for WWII M1911 pistols is about $1000 – $4000+. $2000 seems to be the going price for Service Grade pistols. * I do not expect there to be rack grade pistols for sale initially. ** Depending on what is in the Army inventory, there could be a range of rare pistols in their own categories, but not rare enough to go to auction. I hope the prices will be lower than my estimates. I know many of you are hoping for $500 1911 pistols but I do not realistically expect this to happen. 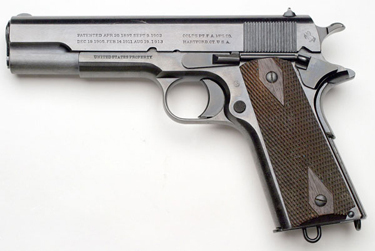 Modern 1911 pistols are popular enough in their own right without the added attraction of being military surplus. Great News! The 1911s Are Coming! No one thought it would happen, but Barack Obama actually did a few days ago sign the National Defense Authorization Act (NDAA) which included an amendment introduced by Rep. Mike Rogers (R-AL3) authorizing the Civilian Marksmanship Program to sell to Americans some 100,000 Model 1911 Colt pistols which have been sitting in warehouses since the US Military replaced the beloved .45 1911 with the 9mm Beretta M9 in 1985. Gun collectors have pushed prices for existing 1911s up to serious levels. Meanwhile, the gospel of the late Jeff Cooper has made the old 1911 into a tremendously popular choice for both target matches and personal defense. These days, everybody, Ruger, Remington, even Smith & Wesson is manufacturing his own knock-off of John Browning’s century-old masterpiece. Nonetheless, guns which saw military service possess a special cachet and will always be particularly appealing to collectors. Frankly, I can’t wait to get my hands on one of these myself. Mike Weiser, astonishingly appearing at what El Rushbo likes to call the Puffington Host, finds the glass half empty. There’s only one little problem. 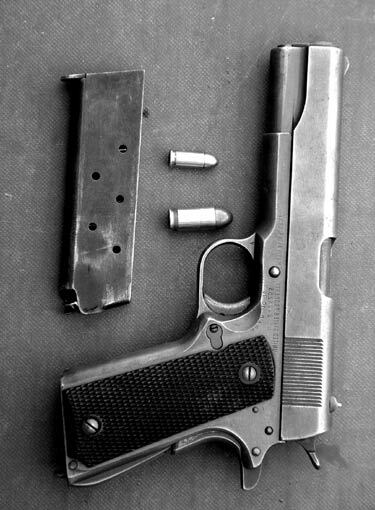 Right now if I want to sell one of my 1911 service pistols with the original markings on the slide and frame, the gun will fetch me somewhere just south of two thousand bucks. Know what’s going to happen to that price when thousands of surplus army pistols hit the street? The value of my 1911 stash just disappeared. Thanks for nothing, NRA. Thanks for nothing President Obama. And Merry Christmas to both of you too. I think his fears may be exaggerated. In the old days, the CMP’s mission was encouraging civilian marksmanship by getting surplus military weapons into the hands of shooters. Before WWII, the CMP sold through the NRA and my uncles used to get Springfields and Enfields for $25 and Krag carbines for $5. These days, the CMP only sells to individuals who jump through lots of hoops, including proving that you participate in matches at a CMP-recognized shooting club, and they sell carefully-graded Garands at pretty steep prices. My guess is that the CMP is going to let go of those 1911s in a slow trickle at very retail-ish prices. They will probably also sell a lot of them at auction. And the supply will be kept low and slow, precisely in order to keep prices up. 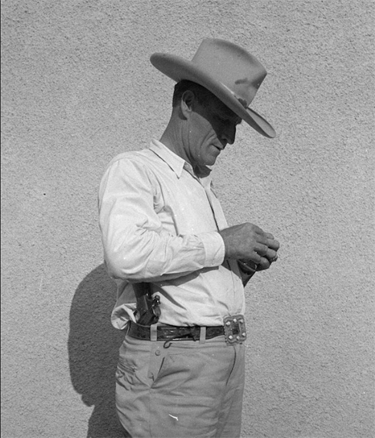 Deadliest Gunfighting Pistols of All Time? Jim Dickson, at Gun Digest, picks the three deadliest gunfighting pistols of all time. His choices are the German Luger, the Colt Model 1911, and the Colt Model 1873 Peacemaker. Personally, I think his list ought to have been longer. But the surprising choice is, of course, the Luger. Americans who played with one will be even more surprised to find the author praising the Luger for its reliability of functioning. When the troops needed pistols the Fatherland set out to supply them, despite the fact that the Luger pistol cost three times as much to manufacture as the Mauser rifle. The Luger proved up to the challenge. It took in stride the mud, dust and sand maelstrom that was a WWI artillery barrage and kept on working when the famed Smith & Wesson Triple-Lock Revolvers were jamming. It would continue firing when its barrel was bulged from being clogged with mud. 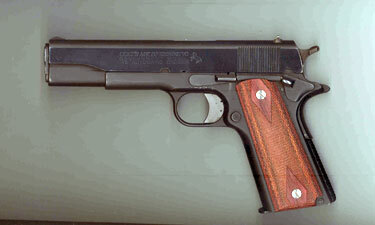 A Browning-style gun with the slide over the barrel is jammed solid until a new barrel can be installed when its barrel is bulged. This feature saved so many German lives in the First World War that when the P38 was designed, the army specifications demanded a fully exposed barrel on it. All the Luger needs for reliability is a magazine spring that is as strong as you can get in the magazine and proper ammo—standard velocity ammo of the proper overall length. Hot loads cycle the action too fast for the magazine to feed cartridges in position to chamber before the bolt rides them down. This was never a problem with German army issue ammo. A larger problem was the fact that the average German soldier was not a pistol shooter. 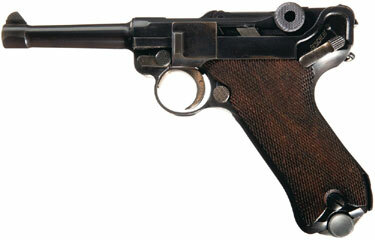 The Luger handled that problem better than any pistol before or since. The Luger is the best pointing pistol ever made, bar none. Just point at the target and you hit it. It is as simple as that. It is also the most accurate pistol you will ever find. Most any good Luger will shoot a 10mm group with 9mm ammo at 25 yards. Armed with the Luger the German troops proved a terror in trench fighting. Every stormtrooper was issued one regardless of rank, and production was geared up to equip every combat soldier by late 1918 or 1919. The Luger was a key factor in the new stormtrooper tactics as well as the new infiltration strategies of General Von Hutier and Colonel Bruchmuller, which had knocked Russia out of the war. The intensity of the trench fighting and the number of kills made by the Luger was staggering. World War II saw more intense fighting with the Luger often being used against Russian human-wave assaults. Sometimes it was the officer’s only weapon and sometimes it was the last thing he had loaded magazines for. At those close ranges one could hardly miss. Once more the tally went up drastically. Add to these figures the numbers of the other countries’ armies that used the Luger and you get a number far exceeding any other pistol. the Archives of Never Yet Melted in the 'Colt Model 1911' Category.